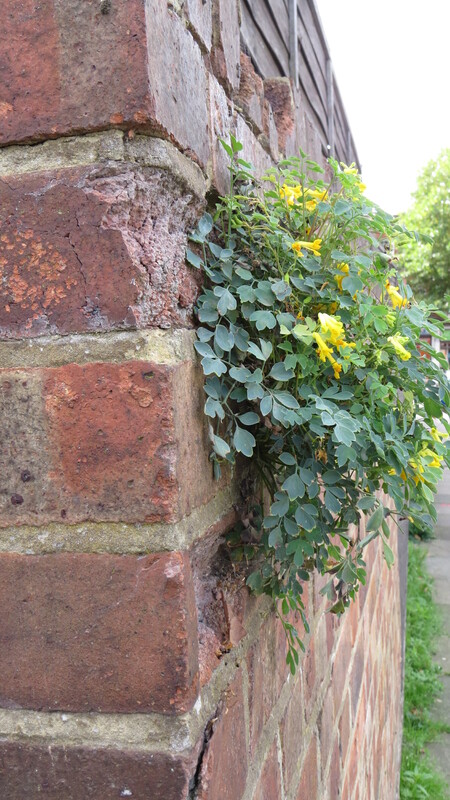 Dear Readers, this is a plant that grows in one spot at the end of Mum and Dad’s road in Milborne St Andrew, Dorset. I love it because of its bright pink and purple flowers, which remind me of lipstick. Common fumitory is in the same family as that urban favourite yellow corydalis, and if you look closely you can see how similar the flowers are. 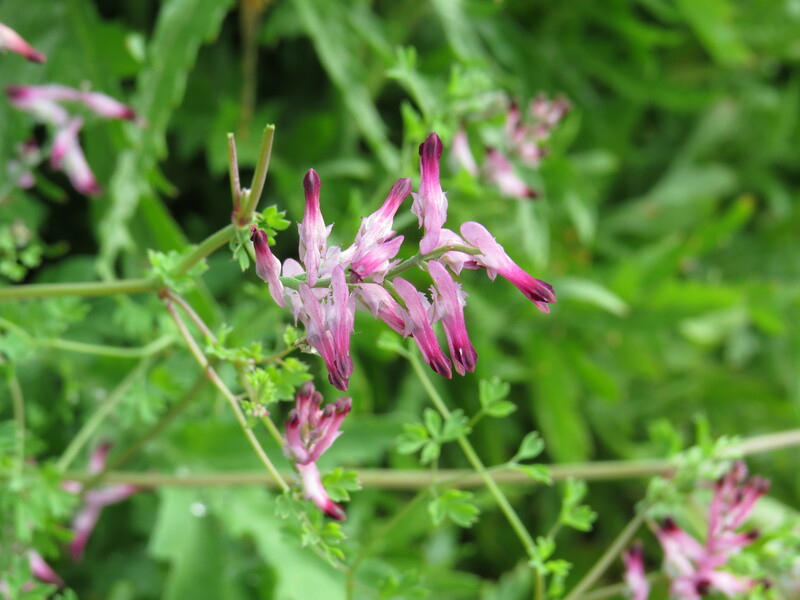 Common fumitory is an ancient introduction to the UK (its natural range is mainland Europe, Western Asia and Northern Africa), and its Latin species name, officinalis, indicates that it was used as a medicinal plant. The name ‘fumitory’ comes from ‘fumus terrae‘, or ‘smoke of the earth’, thought to be because the fine foliage looks a little like a cloud of fumes. Pliny the Elder noted that the sap from the plant, if rubbed in the eyes, made them sore, which is just what happens when ‘smoke gets in your eyes’, and led to another vernacular name, ‘fumewort’. However, the plant was used historically for treating conjunctivitis and other eye complaints, so maybe the soreness was just a necessary side-effect of the treatment. It was also used to treat skin complaints, to reduce the appearance of blemishes, and as a kidney cleanser. ‘ought chiefly to be employed by those who have previously removed those moral blemishes which deform the mind, or degrade the dignity of a reasonable and an immortal being’. In other words, sort yourself out before you start worrying about your freckles. I was very sorry to learn that Rosamund Richardson died last year at the age of 71, having written many books about the British countryside. ‘Britain’s Wild Flowers’ is, I think, her last book, and well worth a place on any bedside table. Other medicinal uses included the treatment of cradle-cap in babies. Common fumitory is said to have roots that smell of smoke, and it is believed to expel evil spirits if burned in the house, or at an exorcism. It is said to protect you if you rub some on your shoes before a journey, and it may also bring you wealth, either spiritual or material. 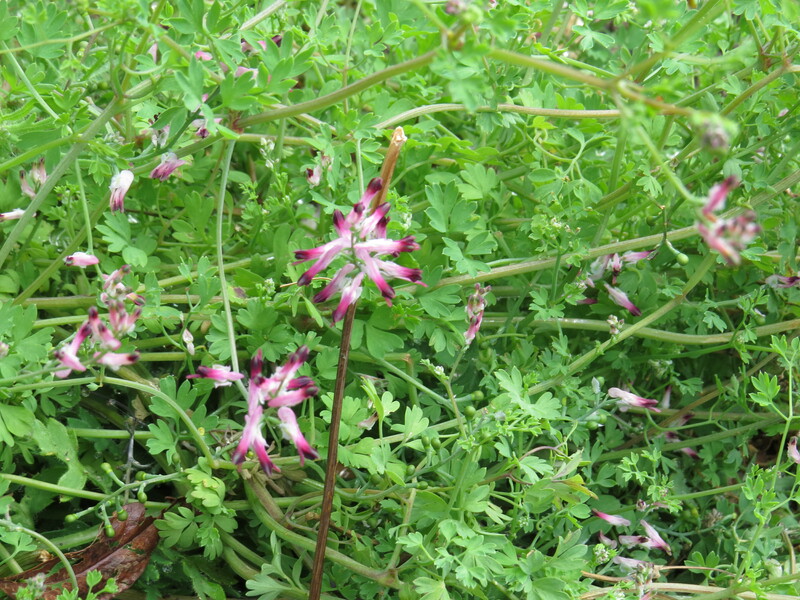 In the Ayurvedic tradition, fumitory is believed to confer long life. In Iran, ‘water of fumitory’ is made by steeping the plant in water overnight and then distilling the liquid – the resulting distillate is used to flavour sherbet. Generally, however, the plant has been used sparingly as food: the leaves are said to be edible, and milk can also be soured by immersing the plant in the liquid. I have no idea what you would do with the milk that was ‘turned’ in this way, but maybe it made for a more pleasant taste than milk that was allowed to go ‘sour’ naturally. Plus, we are only just finding out some of the benefits of fermented foods, so maybe this was found to be healthful. 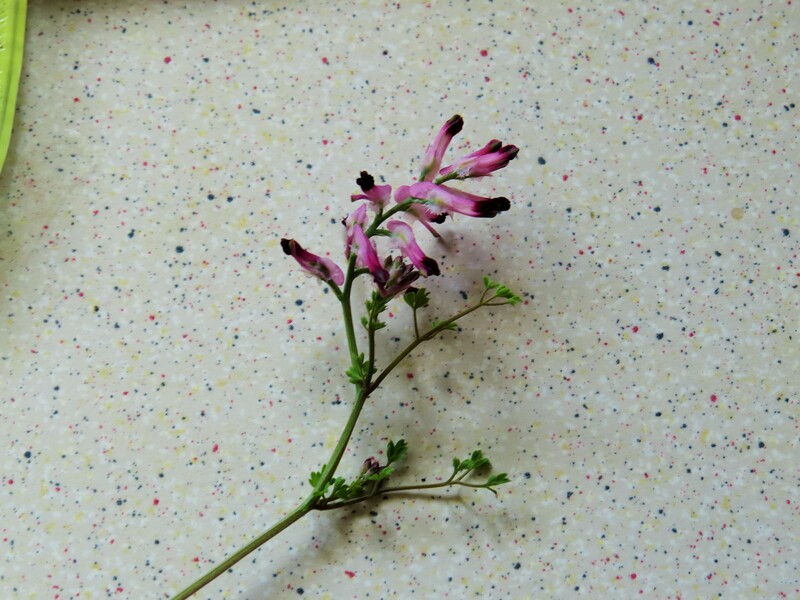 The flowers of fumitory can be used to produce a yellow dye for wool. Although the flowers look very enticing to me (and are indeed nectar-rich), they are rarely pollinated by insects, and so this annual plant reproduces by self-fertilisation. One animal that did favour the seeds and flowers was the increasingly-rare turtle dove, so perhaps this also helped to spread the plant from one place to another. It is thought that our intensive agricultural methods, which mean that there are far fewer ‘weeds’ such as fumitory about, is one factor in the bird’s Red List status. It is also shot in huge numbers as it migrates over countries such as Malta and Cyprus. If I was fumitory’s press agent, I think I’d be complaining. However, Shakespeare was pre-dated in using the word ‘fumitory’ by several hundred years, with Chaucer having the first use of the word in a manuscript in ‘The Nun’s Priest’s Tale’, where the plant is part of a medicine used as a laxative. And finally, here’s a fragment from Gerard Manley Hopkins, that ecstatic poet of kestrel and fallen leaves, on the common fumitory. People seem to either love Hopkins or find him uncomfortably over the top, but I can never read him without a sense of expansion, of the world being larger and more miraculous than I imagined, and in these straightened, black-and-white-no-shades-of-grey times this can surely only be a good thing. The poem below is not one of his best (as a fragment I suspect he meant to work on it but never got round to it), but can’t you just see that furrow? This entry was posted in Bugwoman on Location on June 6, 2018 by Bug Woman. Nice to have a plant one can bring inside without causing a death or other ill fortune. 🙂 Indeed. I was beginning to wonder if there was any such thing. I am pretty sure that I have never seen this plant, in all my years. And me a country girl! I’ve only ever seen this one patch, Toffeeapple, but apparently it’s ‘common’. We’ll both be tripping over it everywhere now I’ve noticed it…. Foliage like columbine. Flowers like dicentra. And actually it’s a member of the poppy family. Plants, eh…..
Hi. I’ve always been curious about this plant. The many possible attributions regarding name omit one that I personally have noticed. Both at my present and my previous residence it grows on the site of the previous year’s bonfire, spreading across the ashes that most other plants avoid. Could this be a reason for its smoky associations?